Wires from that light not making it to the battery? 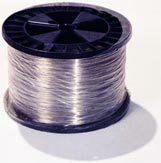 This 32 gauge wire will get you the rest of the way. Works well with 3, 5 and 6 volt lights. Wire provided in white insulation. Choose single or double strand from the options dropdown menu.